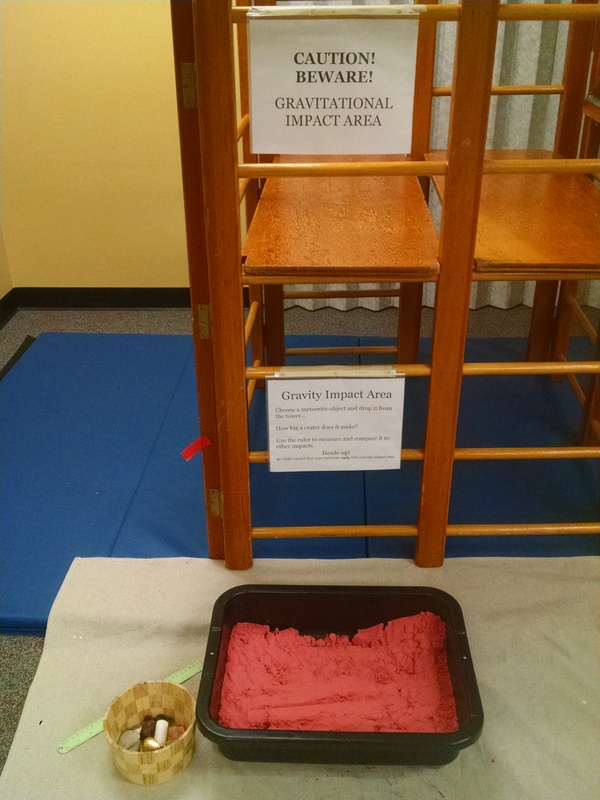 We’re into our ‘abstract concepts made concrete’ unit of our Family Inventors Lab. This week was magnets and gravity. The next session will be temperature and states of matter, followed by electricity. 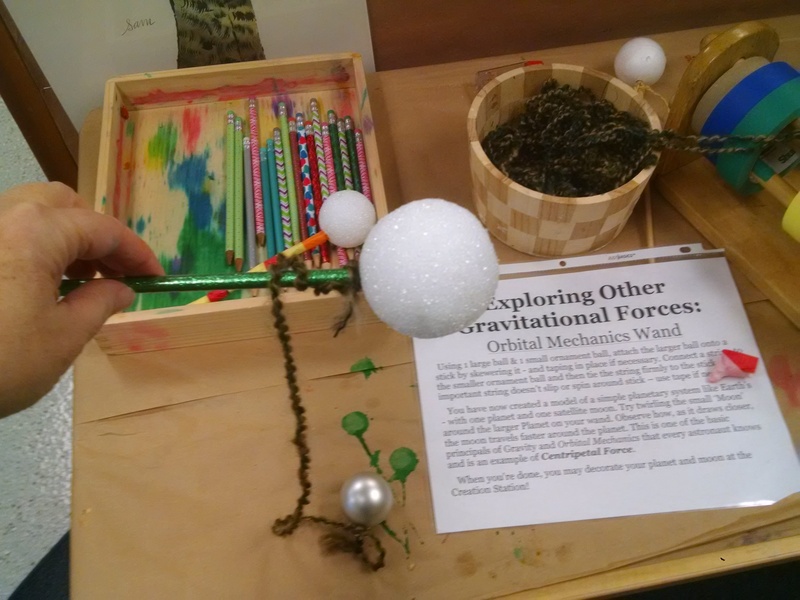 All of these are easy to explore hands-on, and AFTER the kids have had a chance to explore them, you can talk about the theory behind what they’ve observed, then give them more chances to test it. 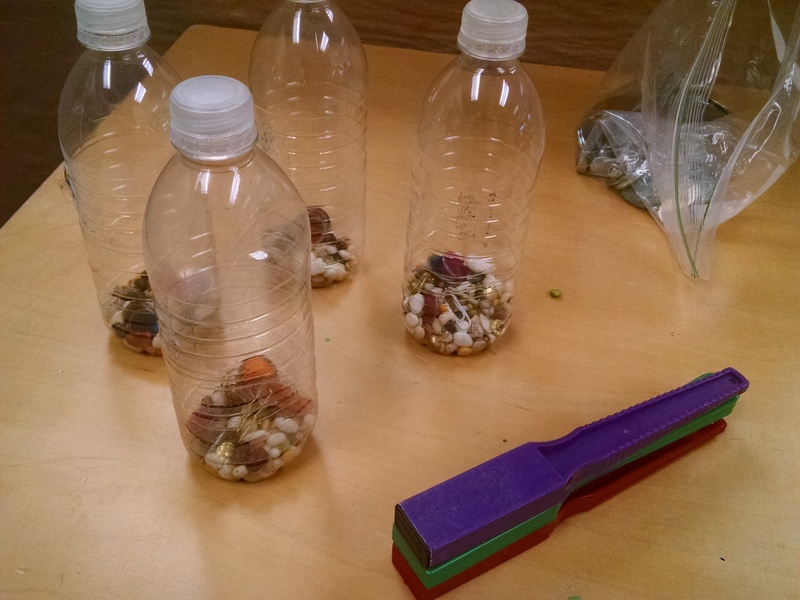 Magnetic and non-magnetic objects: We filled water bottles with objects like beans, rice, washers, paper clips, and plastic toys. These were out on a table with magnetic wands. Kids could move the wand up the side of the bottle to see what objects it picked up. Using magnets to attract hidden objects: We filled the sensory tub with rice, then buried lots of plastic discs with metal rims, mini clothes pins and other objects that magnets would pick up. 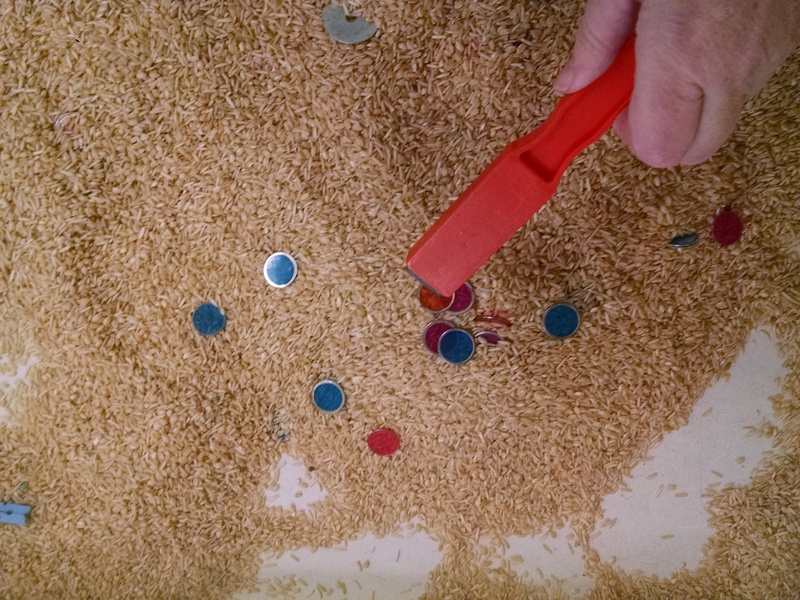 Kids could stir a magnet wand around in the rice, then lift it up to see what it had attracted. More on magnetic poles: It would also be good to have a demonstration of how magnets can either attract each other, or repel each other, depending on the polarity. 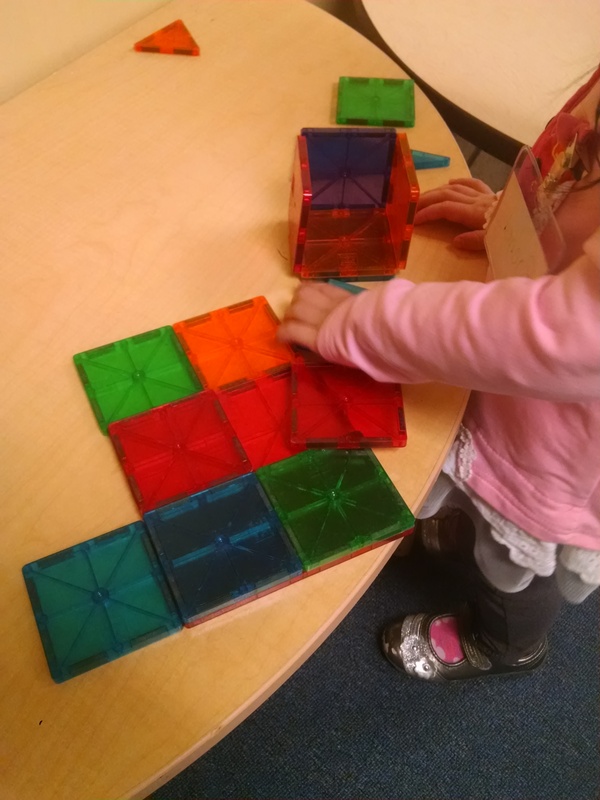 We had one pair of magnets that if you held the round magnet one way, it would pull itself down onto the square magnet, but if you held it the other way, the square magnet would push it away. There are also science toys you can buy where there are disc magnets you mount on a pole, and the magnets can “float” above each other. Sample here . Supplies: big paperclips, magnets, cork or foam, tape, water in a container. Compass. Slowly draw the long magnet along the paperclip in ONE direction only – at least 40 or 50 times down towards the point of the paperclip. Count out loud to keep track. Tape paperclip onto a piece of foam or cork. Fill one of the plastic bowls almost full with water. Place the cork & clip in the water so that it floats evenly. With one finger, gently twirl the clip around once and then watch to see what happens! Check the store-made compass on the table. See if both compasses are pointing the same direction. If we’d only been doing magnets for our theme, there is more we could have done: we had a kids’ magnetic poetry set that would have been fun for our readers, we have a variety of magnetic play-sets where you set up a scene on a magnet board, and we could have done crafts where they mounted pictures on magnets to give as gifts to grandmas. Slide: We set up our climber and slide. 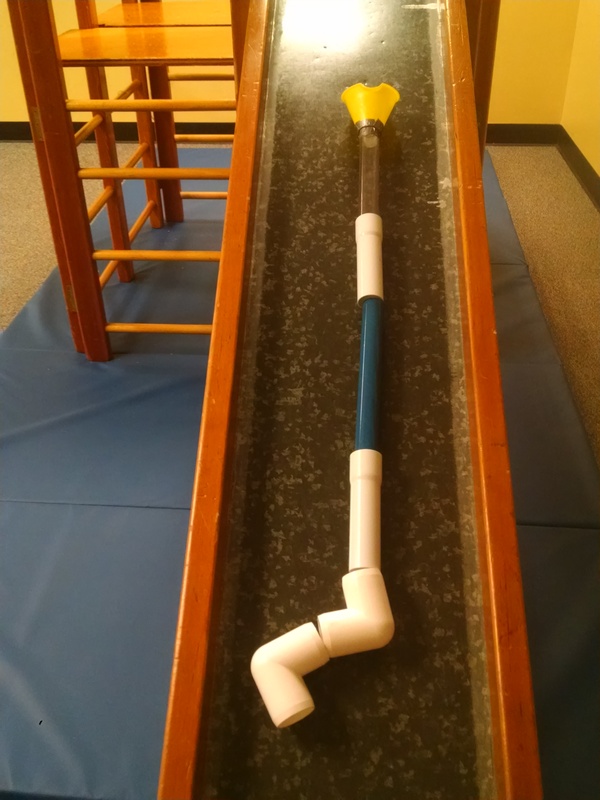 The slide is a great way to learn about gravity! It’s really easy to slide down, and sliding up just doesn’t work. Marble maze: These building toys offer great tinkering opportunities, to build, notice problems, re-build, test, decide to re-build to make it taller, and so on. I especially like out set, which is from Discovery Toys , because it includes a gravity well, a track where you can load 6 – 12 marbles, then dump them in all at once, and other fun details. I did learn something important – I’d originally put this on a table top so it would be easy to build and watch the marbles roll down. But, what I hadn’t taken into account was that for small children, it was then hard to reach the top to drop a marble in. So, the kids were climbing on the furniture to reach the top! (OK, my kid was doing that… ) So, we moved it to the floor. 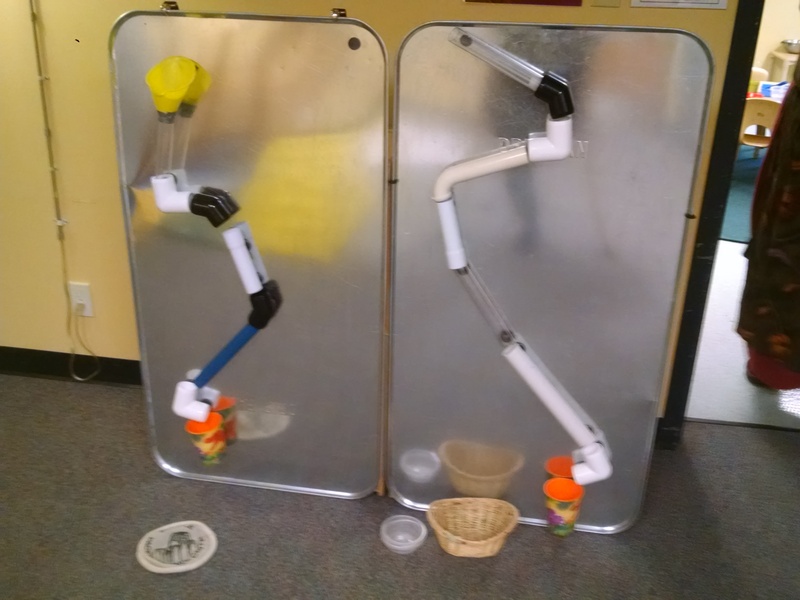 Magnetic ball wall: Based on that standard children’s museum activity, this marble maze is a DIY project (learn how here) using PVC pipes mounted on magnets, stuck to metal oil drip pans, and shooter marbles to run through it. Again, it’s a great tinkering toy – especially because after you finally get everything lined up just right, you’ll run three or four marbles through successfully, then marble #5 bumps something just slightly out of alignment and a marble gets stuck, or marble #6 really knocks it out of line and marbles fall and you have to re-build. How much would you weigh on the moon: Kids were encouraged to weigh themselves on a bathroom scale, then look up on the chart how heavy they would be on the moon and on Mars. We also discussed this idea in circle. This was interesting to our older kids who have some grasp of what “5 pounds” feels like vs. what “60 pounds” feels like. But, too abstract for little ones, really. Though they had fun weighing themselves on the scale, and weighing toys on the table scale. Tie a string to the smaller ornament ball. Then tie the string firmly to the skewer. Tape in place. When you’re done, decorate your planet and moon at Creation Station! Materials: paper bowls or plastic cups, string, scissors, hole punch, and optional materials to decorate ship with. Plus small “passengers” for the ship – could use pompoms or small plastic animals, or whatever you have. Punch holes in the cups or bowls, attach 3–4 lengths of yarn and tie them together. 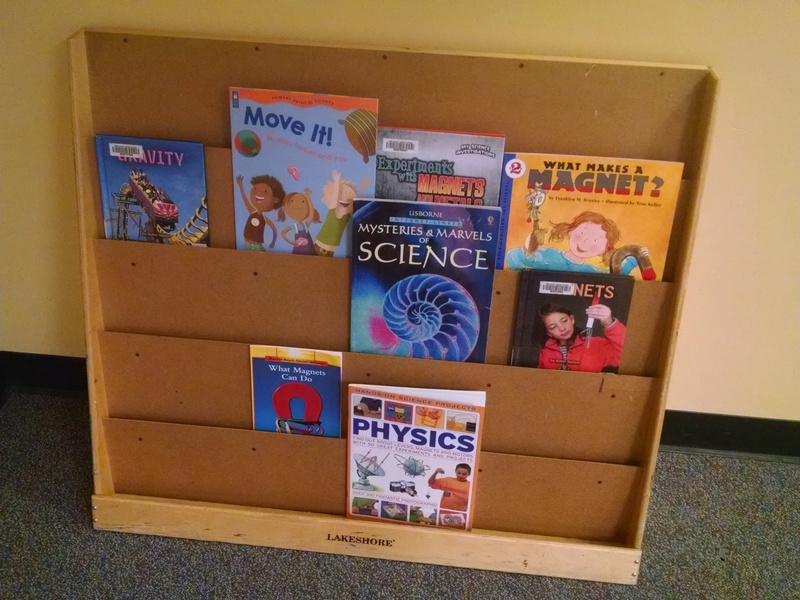 As always, we checked out several theme related books from the library. In opening circle, we read I Fall Down , which is a great book about gravity for this age group (3 – 7) with lots of concrete examples they can try out. In big kids’ closing circle, we read Gravity Is a Mystery by Branley. 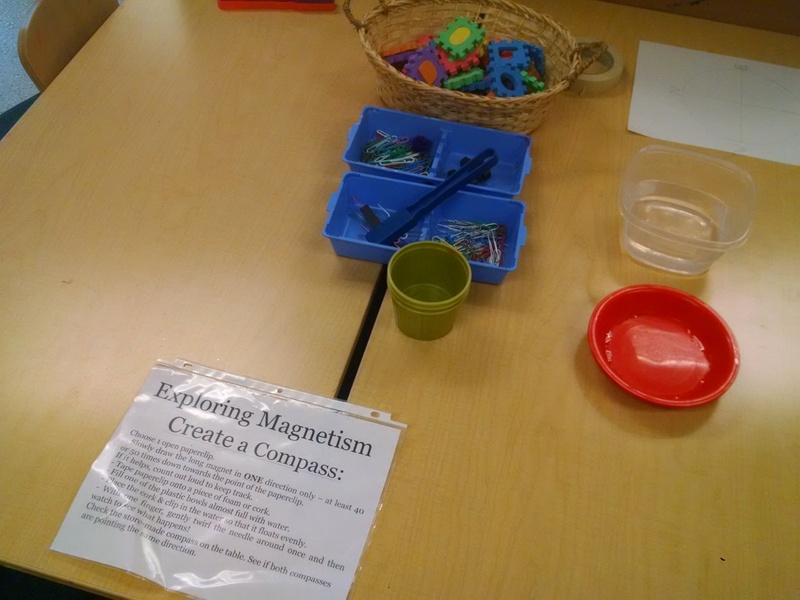 In opening circle, we also explained the basics of how magnets work, so they could understand what they had been playing with, and then gave them ideas for what to explore more of after circle time. 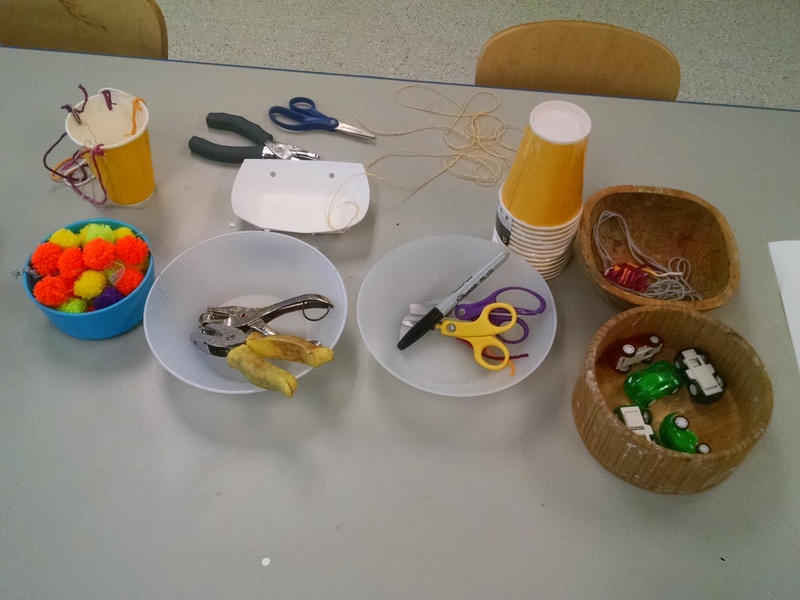 Group Activities: In younger kids’ circle, we poured some items on the floor, then had kids collect them with magnet wands, then sorted and counted what they’d collected. 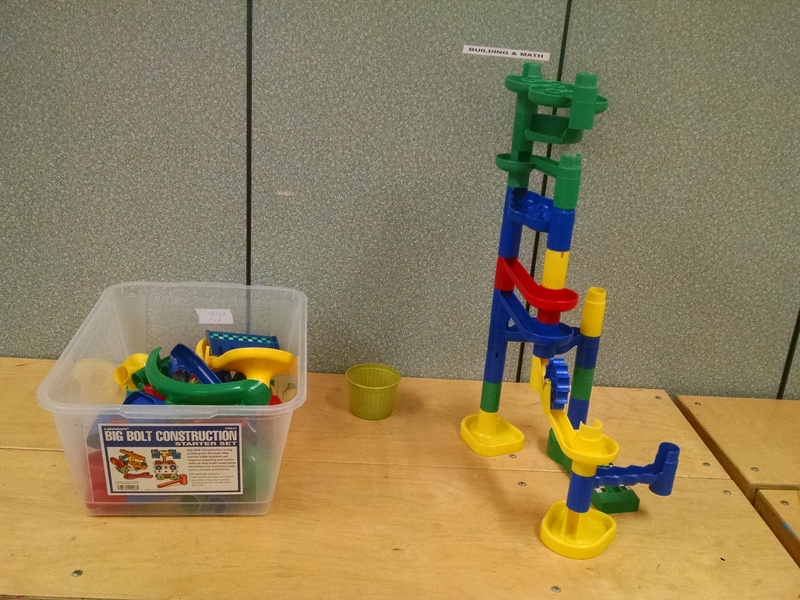 Then we played with the DIY marble run pieces on the slide – see picture at top of post. (One of the kids had discovered that they could stick magnets to the slide, which would have never occurred to us!) This was fun for the little ones and the parents who were there, because the kids could climb up the slide and drop marbles down, and the parents could tinker and keep re-adjusting the pipes so the kids would be successful in getting a marble all the way from the top of the maze to the bottom. With the older kids, we played a magnet game in which we would “switch their poles”. If the teacher said “south pole” they were all attracted toward her and would run toward her, but if she said “north pole” they were all repelled and moved away. It’s basically red light, green light with a twist…. Again, there’s lots more we could do to explore gravity, but this is how many activities we could fit in. We might consider separate units in the future to allow more time. Talk about what would happen if there was no gravity. Perhaps watch videos that show astronauts floating in space, and talk about what that would be like. (Go to YouTube and search for “NASA zero gravity”). Play with dropping objects to show that they fall at the same rate… if kids notice that feathers or flat pieces of paper fall slowly, then discuss that this is due to them being caught on air currents, not because gravity works differently for them.